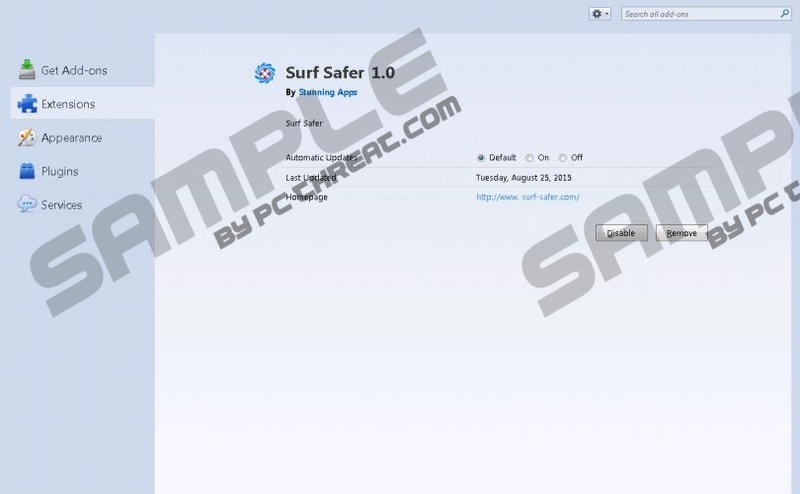 Surf Safer claims to be an application that helps you, well, "surf safer" by alerting you “when a page contains a virus or malware,” but, instead, it has proved to be an ad-supported program that may do the opposite and expose you to potentially unsafe third-party content. There are telltale signs about this adware that clearly signal we are dealing with a questionable program. For example, you cannot download this extension from its official website. Surf Safer may enter your system with a bunch of malware infections, which can seriously increase your system’s vulnerability. Removing Surf Safer is the best you can do in order to stop the avalanche of potential damage to your computer. This adware program affects Google Chrome and Mozilla Firefox. You can find its official website at surf-safer.com, although you will not be able to download it as the extension seems to be currently down because of some maintenance. That looks a bit suspicious and causes us to question the reliability of Surf Safer. The website itself resembles another very similar extension’s website that has the same download warning message. That extension is called BrowserWatchdog, and you can find its website at browserwatchdog.com. However, we do not believe that too many users would find the official website, so this adware must be distributed by other methods as well in order to generate enough income for the creators through third-party advertising. One of the alternative methods is rather questionable as it is frequently used by schemers to spread infections over the web. It is called software bundling. In a software package that contains a free program and some additionally promoted tools, a few malware infections are also added as “icing on the cake.” These infected bundles then get hosted on suspicious file-sharing websites and are mostly downloaded when users click on fake download buttons. Few people know that there is a way out of installing a whole package of threats if they opt out in time. Yes, there is usually an option for you to say no to certain components. But, if you overlook that, you will have to deal with more than just removing Surf Safer from your computer. The Software displays several types of advertising, including but not limited to: (1) sponsored links, (2) traditional display advertisements, such as banner ads, pop-up ads and interstitial ads, (3) coupons, (4) video targeted ads (which may be displayed on a webpage, through our own player, or in another window when you view video content on the internet, such as before or after that video content plays), and (5) offers to download and install other applications. If we add to this that Surf Safer can also collect sensitive information about you that may be disclosed to third parties and that you can be targeted with tailored ads to make you click, well, we only need to put some more oil on the fire by saying that these ads might take you to malicious websites. How does that make you feel? Do you feel safe clicking on these ads? Do you know what can happen if you end up on an unsafe website? Let us just say that it would not end too well for your system’s security and your privacy. If you delete Surf Safer, you will be all the safer, surfer. Unfortunately, the manual removal of this useless application is a bit complicated, but not impossible. First of all, you have to locate and delete the following folders: %PROGRAMFILES%\Surf Safer and %PROGRAMFILES(x86)%\Bench. Once you are done with that, you have to get rid of a few Windows registry keys, which you can find below our article in the instructions. Finally, you have to take care of the browser extensions. If you follow our guide, you have a chance to entirely remove Surf Safer from your system. However, if all this looks too complex for you and you would rather choose an automated method, we can recommend installing a powerful antimalware program. Find the key HKLM\SOFTWARE\Microsoft\Windows\CurrentVersion\Uninstall\39004_Surf Safer and delete it. Find the key HKLM\SOFTWARE\Proxy\Installations\Surf Safer and delete it. Find the key HKLM\SOFTWARE\Surf Safer and delete it. On the left, select Extensions and click on the undesirable extension. Press Alt+T and open Add-ons. Quick & tested solution for Surf Safer removal.